This is often unintentional and can be the result of sites having pages for similar products where the content has been only slightly changed, or because landing pages have been created for PPC campaigns. In this case, Google recommends that webmasters include the preferred version of the URL on their sitemap file, which will help the search engine’s crawlers find the best version. This refers to content identical to that on your website appearing on third party domains, often when sites use scrapers to copy your text and use it to push themselves up the rankings. Naumann claims that Google manages to determine the original source of the content “in most cases”, and that having your content copied shouldn’t impact on your search rankings. Make sure your site’s content is being crawled by Google. Make sure your site is in line with Google’s webmaster guidelines. for more info on the issue. It was a big news week this week with major technology and internet players vying to share the spotlight – some in more positive ways than others. 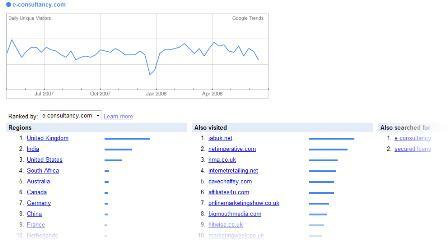 Google Trends is now competing directly with services such as Alexa and Compete, by allowing users to look at trends by website address.